Obviously, you can use fresh brewed coffee or espresso for this treat, but it does serve as a great way to use up the coffee you over-brewed instead of tossing it down the drain. Coffee that has been sitting for a while can get bitter, so sweetening with a touch of agave, sugar or honey is advised. I wouldn't use coffee that is more than a few hours brewed. Heat or reheat the coffee and stir in the sugar to dissolve (you want it to taste a little stronger and sweeter than just drinking coffee). Carefully pour the coffee into a shallow baking pan . You want the coffee to be less than an inch deep. Put the pan in the freezer and every 1/2 hour, remove and use a fork to scrape the icy coffee into crystals, then return to the freezer. When serving, scoop into a glass and top with prepared cream. Serve immediately. *this makes a tasty treat, dessert, a between courses icy palate cleanser, or a finish to a rich meal. Stir the chili powder and cinnamon into the teaspoon of powdered sugar. Whip the cream til thick and add the spicy powdered sugar. Continue whipping the cream to a thick, but not too firm consistency. Keep chilled. Place a small dollop on each Coffee Granita just before serving. Having Coffee Granita on hand in the freezer is so easy, and everyone loves when you bring it out. It always looks like so much more than it is, and who doesn't like the fun of icy treats melting on your tongue. My mom will be proud of you. This time, I really didn't think I would make the Daring Baker's Challenge. First of all, it was British (sorry, but I just haven't tried many British pastries that made me lick my lips for any reason except the great need for moisture.) Secondly, I read the recipe and it seemed that "Suet" was animal fat with the gross factor doubled. Thirdly, Daring Baker's is often a great excuse to cook another sweet, and why would I want SUET in that? Well,meet the little meat pie that had my guests scraping their plates for the last tender crumbs. April 2010 Daring Bakers' challenge was hosted by Esther of The Lilac Kitchen. She challenged everyone to make a traditional British pudding using, if possible, a very traditional British ingredient: suet. Finding suet was a chore for my neighborhood. I had to practically beg a butcher to hold on to some of this fat for me. He was more than willing to take an order for several pounds of it, but told me the small amount I needed usually ends up in the bottom of the garbage at the end of his day. Sheesh! Ultimately, I got to work with it and also made several pies with the alternate choice of Crisco. I've used Crisco for many pastry goods and it does make a flaky crust. The suet (which I rendered, then saved and it had a lard-like feel to it) worked well, too. The filling was left up to our own imagination and research, so I created a Lamb and Veggie filling that was accented with fresh rosemary. It was earthy and fragrant, very satisfying and so delicious my husband actually sighed while eating. I have a real love for individual servings and I figured everyone would enjoy having more of the pastry too. I made these in ramekins and coffee cups. They worked beautifully and I could serve what was needed and save a few in the refrigerator to re-steam when someone else was ready to eat. What a great luncheon dish, huh? Traditionally, these are made in large ceramic bowls and they look fabulous, but I liked the convenience and having my own little pastry pie. 3. Add the water a TBL at a time as you mix. Stop when dough leaves the sides of bowl clean. Don't over handle the dough as it will make a tough pastry. 4. Reserve some dough for the tops, roll the rest out and cut to fit inside your container. 5. Butter the inside of your container well, and place the pastry dough around the inside and make sure to leave a lip above the top. 8. Seal well and cover with a top of parchment, and a sheet of foil (pleated for expansion) Secure with string (mine were small enough to remove with tongs and strings weren't needed), and place in a steamer over boiling water. Steaming can be up to 5 hours (with my small ones it was 2 hours). There is a lot of leeway with steaming, but it's hard to over-steam. One way to tell it is cooked is when the pastry changes color - goes from white to sort of light golden brown. If not used right away- put in refrigerator and re-steam for about an hour for serving. In a large oven proof skillet, brown the lamb cupbes in a little olive oil. Remove and hold. Add onions, carrots, salt and pepper (to taste) and cook on low/med for about 5 minutes. Stir in flour and cook for about 2 minutes. Add stock and stir to combine. Return the lamb, add corn, mushrooms and rosemary. Fold together, cover and cook in oven on 325F for 1 hour. Remove the rosemary sprigs, stir to combine flavors and let cool before using as a filling in the pastry. Steam these for two hours. Remove foil and gently pull pastry from the edges of the ramekins or cups. You may need to use a knife to run around the inside of the cups. Turn upside down onto plate. You'll love the simple, elegant look of these individual meat meals. The British call them puddings, but I didn't say that to my guests until after they had tasted them and like them. We're so conditioned to our own little vocabularies that even when I told them later, it was met with grimaces. But, the spoons returned to digging out the goodies. Tally ho! I can honestly say that I have never bitten into a lovely, warm scone topped with sweet, plump jammy fruit and thought to myself, "What this is missing is some ground black pepper." So, when I was reading through Mes Confitures by Christine Ferber ( a most beloved maker of jams and jellies, second only in my mind to June Taylor) and read about a jam made with strawberries, fresh mint and black pepper - well, I had to give it some thought. Ladies and Gents, it works! Not only does it work, it has a remarkable balance that keeps the sugar (that can sometimes be too much, especially for non-jam loving folks), in the background. Suddenly, the fruit is first, then a hint of mint rises up and never do you think, "oh wow, pepper in my mouth." It just seems to make the sugar be a little more generous with the spotlight. This month's Tigress Can Jam ingredient was any kind of herb that we fancied using. I actually still have a nice Mint plant doing well even after the wet winter here, so I definitely wanted to use that. Then, the Farmer's Market starting showing off the first of the season's strawberries for us fortunate Californians, so it was easy to see where my combo was headed. I, frankly, would never have thought to use pepper on my own - maybe balsamic vinegar or vanilla or perhaps a tea blend, but never ground pepper. Since the strawberries are also a little tangy this early in the year, the pepper really played nicely with the acids and herbal notes. The recipe is a breeze, although in my adaptation I have cut a whole day off of the macerating (and I still do it overnight once). In a ceramic bowl, add the strawberries, lemon zest and juice, and sugar. Fold together just to mix and cover with parchment paper and let macerate overnight in the refrigerator. Next day, bring the preparation to a simmer in a preserving pot or large saucepan. Stir gently to dissolve all sugar for about 5 minutes. Strain through a sieve and hold the fruit separately while you return the syrup to the pan and bring to a boil, cooking on high til concentrated at 221F on a candy thermometer. Add the fruit back into the pot with the mint and ground pepper. Return to boil for about 5 minutes, stirring gently. Check the set. Fill sterilized jars, immediately, and close with lids. Boil in a hot waterbath, covering the jars by 1 inch of water, for 10 minutes. See "How To Preserve" for any questions about water baths. Remove carefully to a rack to cool and seal. Do not move jars for 24 hours to secure the seal. Here's a "Simple Saturday" recipe that is perfect for a quick party appetizer and can be casual or elegant depending on how you serve it. I'd caution against drinking during prep; You do want to be able to answer the door when your guests arrive, heh heh. 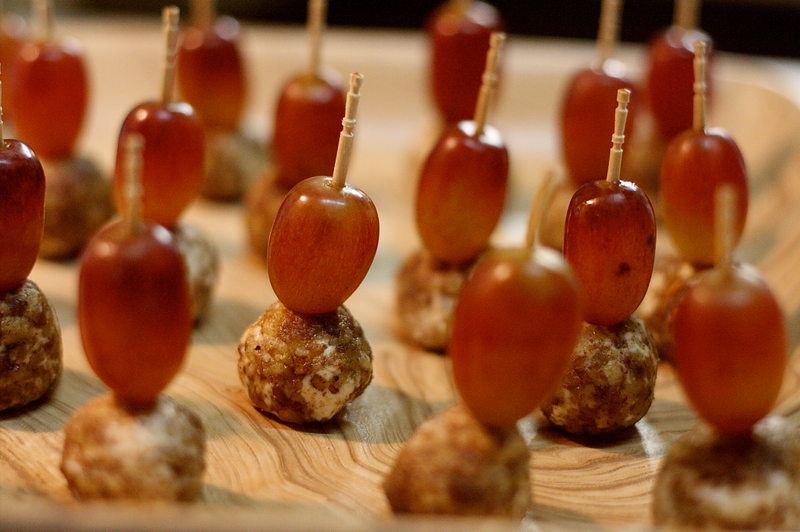 Using garnish toothpicks, skewer one grape and then one warm goat cheese ball at a time, then place on a serving platter. 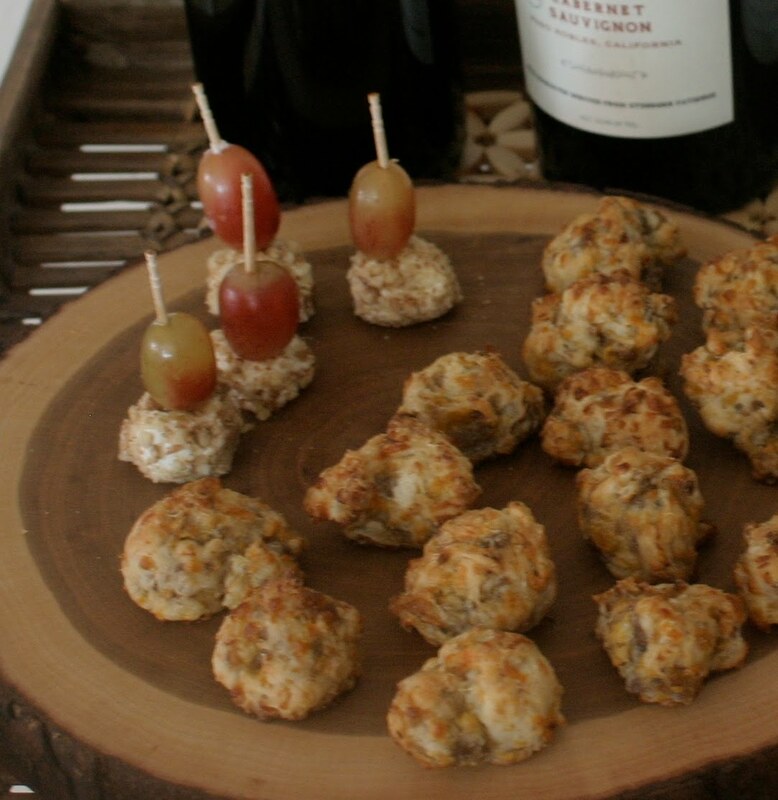 This simple appetizer is packed with flavor and folks love them. Make plenty. My "Farming" grandma made a thick southern soup called "Brunswick Stew" in a giant cast iron belly pot on an open flame in the side yard. The side yard was next to the Salt House, across from the "lit'l hay loft" and near the Well-House where she also stored about 2 years worth of grown-and-canned green beans, corn, tomatoes, squash and who knows what else. 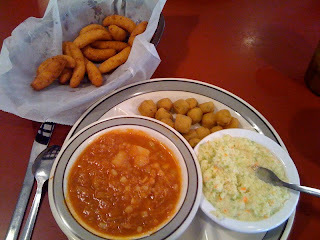 Historically, Brunswick Stew contained squirrel, and rabbit and many fresh vegetables. Mine has one of those three: fresh vegetables. As many times as I have eaten this stew, topped biscuits with this stew, and helped stir this stew - I had never made this stew myself. I was more than thrilled to have it as a Daring Cooks challenge recipe for this month. I made enough to feed a Southern Baptist Homecoming, but it freezes really well and may even taste better for the time to marinade. Yes, there are a lot of ingredients, but you can take a short cut if you use frozen fresh already cut veggies. Don't use packaged meats, though. The deep complex flavors that come from browning your meats and building on the tasty bits they create are very important. I'm one of my biggest fans of my own cooking (yeah, I'll say it), but I'd still pass up my own stew for a little restaurant in Durham, NC that I've been going to since I was "this high to a grasshopper". Tommy Bullock and his whole family have been serving folks since his dad opened this restaurant in 1952. I think some of the staff have been there since then, too. When I visit home, I NEVER miss having my bowl of Brunswick Stew with Cole Slaw and multiple baskets of the best Cornbread Hushpuppies ever created. This is a place where Iced Tea means sweetened Iced Tea and you'd have to tell them if ya want it any other way. The waitresses and waiters are not folks passing through on their way to an acting career, this IS their career and they serve you proudly. 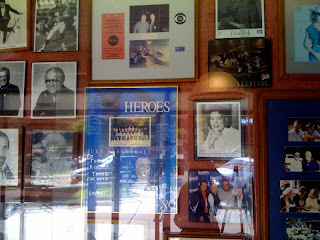 Along the walls are pictures of many "celebrity types" who have enjoyed the food at Bullocks during various functions, charity events and filming. 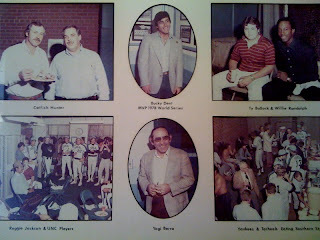 When I was a teenager I dreamed of having my acting photo up on that wall, too. The food and the authentic people are why they come, and why they return over and over. 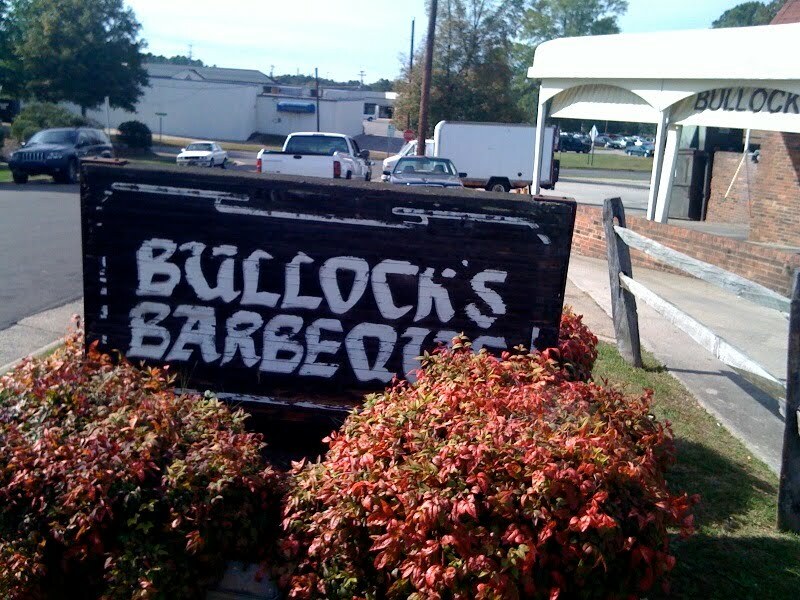 The Barbecue is cooked long and slow outside and you can order it sliced or pulled. 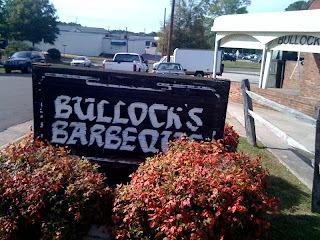 Bullocks opens at lunch and closes by 8pm and never opens on Sunday or Monday. When you're good, you can call it the way it works for you and your family. They're almost European in that way, but it stops there. This is Southern America down the line: casual, excellent quality, inexpensive, family friendly, cash only, mints and toothpicks on the counter when you pay out. There is always a line, but I've never felt rushed once I sat down. If you're ever near it, try it; You will love it. Until then, making your own will give you an amazing feeling of creating something healthy and rich with history. 1-In the largest stockpot you have, preferably a 10-12 qt or even a Dutch Oven if you’re lucky enough to have one, fry the bacon over medium-high heat until it just starts to crisp. Transfer to a large bowl, and set aside. Reserve most of the bacon fat in your pan, and with the pan on the burner, add in the chiles. Toast the chiles until they just start to smell good, or make your nose tingle, about a minute tops. Remove to bowl with the bacon. 2- Season liberally both sides of the rabbit (pork) and chicken pieces with sea salt and pepper. Place the rabbit pieces in the pot and sear off all sides possible. You just want to brown them, not cook them completely. Remove to bowl with bacon and chiles, add more bacon fat if needed, or olive oil, or other oil of your choice, then add in chicken pieces, again, browning all sides nicely. Remember not to crowd your pieces, especially if you have a narrow bottomed pot. Put the chicken in the bowl with the bacon, chiles and rabbit. Set it aside. 3- Add 2 cups of your chicken broth or stock, if you prefer, to the pan and basically deglaze the4 pan, making sure to get all the goodness cooked onto the bottom. The stock will become a nice rich dark color and start smelling good. Bring it up to a boil and let it boil away until reduced by at least half. Add your remaining stock, the bay leaves, celery, potatoes, chicken, rabbit, bacon, chiles and any liquid that may have gathered at the bottom of the bowl they were resting in. Bring the pot back up to a low boil/high simmer, over medium/high heat. Reduce heat to low and cover, remember to stir every 15 minutes, give or take, to thoroughly meld the flavors. Simmer, on low, for approximately 1 ½ hours. The stock may become a yellow tinge with pieces of chicken or rabbit floating up, the celery will be very limp, as will the chiles. Taste the stock, according to the recipe, it “should taste like the best chicken soup you’ve ever had”. 4- With a pair of tongs, remove the chicken and rabbit pieces to a colander over the bowl you used earlier. Be careful, as by this time, the meats will be very tender and may start falling apart. Remove the bay leaf, celery, chiles, bacon and discard. After you’ve allowed the meat to cool enough to handle, carefully remove all the meat from the bones, shredding it as you go. Return the meat to the pot, throwing away the bones. Add in your carrots, and stir gently, allowing it to come back to a slow simmer. Simmer gently, uncovered, for at least 25 minutes, or until the carrots have started to soften. 5- Add in your onion, butterbeans, corn and tomatoes. Crush the tomato, then add them to the pot. Simmer for another 30 minutes, stirring every so often until the stew has reduced slightly, and onions, corn and butterbeans are tender. Remove from heat and add in vinegar, lemon juice, stir to blend in well. Season to taste with sea salt, pepper, and Tabasco sauce if desired. 6 You can either serve immediately or refrigerate for 24 hours, which makes the flavors meld more and makes the overall stew even better. Serve hot, either on its own, or with a side of corn bread, over steamed white rice, with any braised greens as a side. Spread the chicken skins out on a parchment lined baking sheet. Salt, pepper and a dash of Chipotle powder. Bake at 250F for 2-3 hours until crispy. The mission was to bring snack food - no wait, "healthy" snack food. It was to feed 100 teenagers, no wait, 100 "Drama Dept." teenagers (they are not shy). My son is a ninth grader in the High School Spring Musical and "hell week" (rehearsals everyday til late at night) is this week. The parents try to pitch in by bringing food and waters, etc. for the "struggling actors" who are confined to their art (said with back of hand thrown to forehead in mock despair) in the auditorium for hours. These snack crackers are fast and easy, and addictive. I'm glad they're out of here or I would've eaten a pound by myself. I don't know why a pound of food translates into 5 pounds of weight, but it's one of the many unfair things about the culinary world (said with back of hand thrown to forehead in true despair). Put all ingredients into the food processor and pulse til it's a small crumbly mixture. Add a few Tbls. of cold water, a little at a time, just until it holds together. Remove and form into two disks, wrap both in plastic and chill for about 1/2 hour. Place on a parchment lined baking sheet and bake at 350F for about 15 - 18 minutes. Cool on the sheet and fill up the bowls! THEY LOVED THEM, I should have made more. Quote from one of the "Flying Monkeys" (the play is THE WIZ): "I can carry these in my pocket on the stage" Ok, ewww, but yay at the same time.